2004-04-30 Assigned to ALLERGAN, INC. reassignment ALLERGAN, INC. ASSIGNMENT OF ASSIGNORS INTEREST (SEE DOCUMENT FOR DETAILS). Assignors: HUGHES, PATRICK M.
Biocompatible intraocular implants include a prostamide component and a biodegradable polymer that is effective in facilitating release of the prostamide component into an eye for an extended period of time. The prostamide component may be associated with a biodegradable polymer matrix, such as a matrix of a two biodegradable polymers. The implants may be placed in an eye to treat or reduce a at least one symptom of an ocular condition, such as glaucoma. The present invention generally relates to devices and methods to treat an eye of a patient, and more specifically to intraocular implants that provide extended release of a therapeutic agent to an eye in which the implant is placed to treat ocular hypertension, such as by reducing or at least maintaining intraocular pressure, and to methods of making and using such implants. Considering all types together, glaucoma occurs in about 2% of all persons over the age of 40 and may be asymptotic for years before progressing to rapid loss of vision. In cases where surgery is not indicated, topical beta-adrenoreceptor antagonists have traditionally been the drugs of choice for treating glaucoma. Prostaglandins were earlier regarded as potent ocular hypertensives; however, evidence accumulated in the last two decades shows that some prostaglandins are highly effective ocular hypotensive agents and are ideally suited for the long-term medical management of glaucoma. (See, for example, Starr, M. S. Exp. Eye Res. 1971, 11, pp. 170-177; Bito, L. Z. Biological Protection with Prostaglandins Cohen, M. M., ed., Boca Raton, Fla., CRC Press Inc., 1985, pp. 231-252; and Bito, L. Z., Applied Pharmacology in the Medical Treatment of Glaucomas Drance, S. M. and Neufeld, A. H. eds., New York, Grune & Stratton, 1984, pp. 477-505). 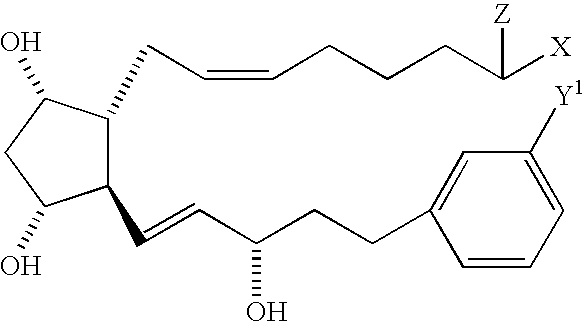 Such prostaglandins include PGF2α, PGF1α, PGE2, and certain lipid-soluble esters, such as C1 to C5 alkyl esters, e.g. 1-isopropyl ester, of such compounds. In U.S. Pat. No. 4,599,353 certain prostaglandins, in particular PGE2 and PGF2α and the C1 to C5 alkyl esters of the latter compound, were reported to possess ocular hypotensive activity and were recommended for use in glaucoma management. Although the precise mechanism is not yet known, recent experimental results indicate that the prostaglandin-induced reduction in intraocular pressure results from increased uveoscleral outflow [Nilsson et al., Invest. Ophthalmol. Vis. Sci. 28(suppl), 284 (1987)]. The isopropyl ester of PGF2α has been shown to have significantly greater hypotensive potency than the parent compound, which was attributed to its more effective penetration through the cornea. In 1987, this compound was described as “the most potent ocular hypotensive agent ever reported.” [See, for example, Bito, L. Z., Arch. Ophthalmol. 105, 1036 (1987), and Siebold et al., Prodrug 5, 3 (1989)]. Certain prostaglandins and their analogs and derivatives, such as the PGF2α derivative latanoprost, sold under the trademark Xalatan®, have been established as compounds useful in treating ocular hypertension and glaucoma. However, latanoprost, the first prostaglandin approved by the United States Food And Drug Administration for this indication, is a prostaglandin derivative possessing the undesirable side effect of producing an increase in brown pigment in the iris of 5-15% of human eyes. The change in color results from an increased number of melanosomes (pigment granules) within iridial melanocytes. See e.g., Watson et al., Ophthalmology 103:126 (1996). While it is still unclear whether this effect has additional and deleterious clinical ramifications, from a cosmetic standpoint alone such side effects are undesirable. Certain phenyl and phenoxy mono, tri and tetra nor prostaglandins and their 1 -esters are disclosed in European Patent Application 0,364,417 as useful in the treatment of glaucoma or ocular hypertension. In a series of United States patent applications assigned to Allergan, Inc. prostaglandin esters with increased ocular hypotensive activity accompanied with no or substantially reduced side-effects are disclosed. U.S. patent application Ser. No. 386,835 (filed Jul. 27, 1989), relates to certain 11-acyl-prostaglandins, such as 11-pivaloyl, 11-acetyl, 11-isobutyryl, 11-valeryl, and 11-isovaleryl PGF2α. Intraocular pressure reducing 15-acyl prostaglandins are disclosed in U.S. Ser. No. 357,394 (filed May 25, 1989). Similarly, 11,15-9,15- and 9,11-diesters of prostaglandins, for example 11,15-dipivaloyl PGF2α are known to have ocular hypotensive activity. See U.S. Ser. No. 385,645 filed Jul. 27, 1990, now U.S. Pat. Nos. 4,494,274; 584,370 which is a continuation of U.S. Ser. No. 386,312, and U.S. Ser. No. 585,284, now U.S. Pat. No. 5,034,413 which is a continuation of U.S. Ser. No. 386,834, where the parent applications were filed on Jul. 27, 1989. Woodward et al U.S. Pat. Nos. 5,688,819 and 6,403,649 disclose certain cyclopentane heptanoic acid, 2-cycloalkyl or arylalkyl compounds as ocular hypotensives. These compounds, which can properly be characterized as hypotensive lipids, are effective in treating ocular hypertension. As one example, the prostamide analog, bimatoprost, has been discovered to be effective in reducing intraocular pressure possibly by increasing the aqueous humour outflow of an eye (Woodward et al., AGN 192024 (Lumigano®): A Synthetic Prostamide Analog that Lowers Primate Intraocular Pressure by Virtue of Its Inherent Pharmacological Activity, ARVO 2002; (CD-ROM):POS; Chen et al., Lumigan®: A Novel Drug for Glaucoma Therapy, Optom In Pract, 3:95-102 (2002); Coleman et al., A 3-Month Randomized Controlled Trial of Bimatoprost (LUMIGAN) versus Combined Timolol and Dorzolamide (Cosopt) in Patients with Glaucoma or Ocular Hypertension, Ophthalmology 110(12): 2362-8 (2003); Brubaker, Mechanism of Action of Bimatoprost (Lumigan™), Surv Ophthalmol 45 (Suppl 4):S347-S351 (2001); and Woodward et al., The Pharmacology of Bimatoprost (Lumigan™), Surv Ophthalmol 45 (Suppl 4) S337-S345 (2001). Bimatoprost is an analog (e.g., a structural derivative) of a naturally occurring prostamide. Bimatoprost's chemical name is (Z)-7-[(1R,2R,3R,5S)-3,5-Dihydroxy-2-[1E,3S)-3-hydroxy-5-phenyl-1-pentenyl]cyclopentyl]-5-N-ethylheptenamide, and it has a molecular weight of 415.58. It's molecular formula is C25H37NO4. Bimatoprost is available in a topical ophthalmic solution under the tradename Lumigan® (Allergan, Inc.). Each mL of the solution contains 0.3 mg of bimatoprost as the active agent, 0.05 mg of benzalkonium chloride (BAK) as a preservative, and sodium chloride, sodium phosphate, dibasic; citric acid; and purified water as inactive agents. Biocompatible implants for placement in the eye have been disclosed in a number of patents, such as U.S. Pat. Nos. 4,521,210; 4,853,224; 4,997,652; 5,164,188; 5,443,505; 5,501,856; 5,766,242; 5,824,072; 5,869,079; 6,074,661; 6,331,313; 6,369,116; and 6,699,493. It would be advantageous to provide eye implantable drug delivery systems, such as intraocular implants, and methods of using such systems, that are capable of releasing a therapeutic agent, such as a hypotensive agent, at a sustained or controlled rate for extended periods of time and in amounts with few or no negative side effects. The present invention provides new drug delivery systems, and methods of making and using such systems, for extended or sustained drug release into an eye, for example, to achieve one or more desired therapeutic effects. The drug delivery systems are in the form of implants or implant elements that may be placed in an eye. The present systems and methods advantageously provide for extended release times of one or more therapeutic agents. Thus, the patient in whose eye the implant has been placed receives a therapeutic amount of an agent for a long or extended time period without requiring additional administrations of the agent. For example, the patient has a substantially consistent level of therapeutically active agent available for consistent treatment of the eye over a relatively long period of time, for example, on the order of at least about one week, such as between about two and about six months after receiving an implant. Such extended release times facilitate obtaining successful treatment results. Intraocular implants in accordance with the disclosure herein comprise a therapeutic component and a drug release sustaining component associated with the therapeutic component. In accordance with the present invention, the therapeutic component comprises, consists essentially of, or consists of, a prostamide component, such as a prostamide derivative that is effective in reducing or maintaining a reduced intraocular pressure in a hypertensive eye. The drug release sustaining component is associated with the therapeutic component to sustain release of an amount of the prostamide component into an eye in which the implant is placed. The amount of the prostamide component is released into the eye for a period of time greater than about one week after the implant is placed in the eye and is effective in treating or reducing at least one symptom of an ocular condition of an eye. Advantageously, the present intraocular implants may be effective in relieving a hypertensive eye by reducing the intraocular pressure of the eye or maintaining the intraocular pressure at a reduced level. In one embodiment, the intraocular implants comprise prostamide component and a biodegradable polymer matrix. The prostamide component is associated with a biodegradable polymer matrix that releases drug at a rate effective to sustain release of an amount of the prostamide component from the implant effective to treat an ocular condition. The intraocular implant is biodegradable or bioerodible and provides a sustained release of the prostamide component in an eye for extended periods of time, such as for more than one week, for example for about three months or more and up to about six months or more. The biodegradable polymer component of the foregoing implants may be a mixture of biodegradable polymers, wherein at least one of the biodegradable polymers is a polylactic acid polymer having a molecular weight less than 64 kiloDaltons (kD). Additionally or alternatively, the foregoing implants may comprise a first biodegradable polymer of a polylactic acid, and a different second biodegradable polymer of a polylactic acid. Furthermore, the foregoing implants may comprise a mixture of different biodegradable polymers, each biodegradable polymer having an inherent viscosity in a range of about 0.2 deciliters/gram (dl/g) to about 1.0 dl/g. The prostamide component of the implants disclosed herein may include prostamide derivatives, such as a prostamide analog, that are effective in treating ocular conditions. One example of a suitable prostamide derivative is bimatoprost or a salt thereof. In addition, the therapeutic component of the present implants may include one or more additional and different therapeutic agents that may be effective in treating an ocular condition. A method of making the present implants involves combining or mixing the prostamide component with a biodegradable polymer or polymers. The mixture may then be extruded or compressed to form a single composition. The single composition may then be processed to form individual implants suitable for placement in an eye of a patient. The implants may be placed in an ocular region to treat a variety of ocular conditions. For example, the implants may be effective in reducing ocular hypertension, and thereby may be effective in reducing at least one symptom of an ocular condition associated with an increased intraocular pressure. Kits in accordance with the present invention may comprise one or more of the present implants, and instructions for using the implants. For example, the instructions may explain how to administer the implants to a patient, and types of conditions that may be treated with the implants. As described herein, controlled and sustained administration of a therapeutic agent through the use of one or more intraocular implants may improve treatment of undesirable ocular conditions. The implants comprise a pharmaceutically acceptable polymeric composition and are formulated to release one or more pharmaceutically active agents, such as a prostamide, a prostamide derivative, such as a prostamide analog, or other intraocular pressure lowering agent, over an extended period of time. The implants are effective to provide a therapeutically effective dosage of the agent or agents directly to a region of the eye to treat or prevent one or more undesirable ocular conditions. Thus, with a single administration, therapeutic agents will be made available at the site where they are needed and will be maintained for an extended period of time, rather than subjecting the patient to repeated injections or repeated administration of topical drops. An intraocular implant in accordance with the disclosure herein comprises a therapeutic component and a drug release sustaining component associated with the therapeutic component. In accordance with the present invention, the therapeutic component comprises, consists essentially of, or consists of, a prostamide component. The drug release sustaining component is associated with the therapeutic component to sustain release of an effective amount of the prostamide component into an eye in which the implant is placed. The amount of the prostamide component is released into the eye for a period of time greater than about one week after the implant is placed in the eye, and is effective in treating or reducing a symptom of an ocular condition. As used herein, an “intraocular implant” refers to a device or element that is structured, sized, or otherwise configured to be placed in an eye. Intraocular implants are generally biocompatible with physiological conditions of an eye and do not cause adverse side effects. Intraocular implants may be placed in an eye without disrupting vision of the eye. As used herein, a “prostamide component” refers to a portion of an intraocular implant that comprises one or more prostamides, one or more prostamide derivatives, such as a prostamide analog, salts thereof, and mixtures thereof. A prostamide derivative is a compound that contains the essential elements of the prostamide from which it is derived in order to provide a therapeutic effect. A prostamide derivative includes prostamide analogs, and can be identified using any conventional methods known by persons of ordinary skill in the art used to evaluate the efficacy of a prostamide. For example, therapeutically effective prostamide derivatives can be identified by applying the prostamide derivative to an eye with increased intraocular pressure, and evaluating whether the intraocular pressure decreases after the application. A prostamide component may also include one or more prostaglandin analogs. As used herein, a “drug release sustaining component” refers to a portion of the intraocular implant that is effective to provide a sustained release of the therapeutic agents of the implant. A drug release sustaining component may be a biodegradable polymer matrix, or it may be a coating covering a core region of the implant that comprises a therapeutic component. As used herein, “associated with” means mixed with, dispersed within, coupled to, covering, or surrounding. conjunctival diseases; conjunctivitis; corneal diseases; corneal ulcer; dry eye syndromes; eyelid diseases; lacrimal apparatus diseases; lacrimal duct obstruction; myopia; presbyopia; pupil disorders; refractive disorders and strabismus. Glaucoma can also be considered to be an anterior ocular condition because a clinical goal of glaucoma treatment can be to reduce a hypertension of aqueous fluid in the anterior chamber of the eye (i.e. reduce intraocular pressure). Thus, a posterior ocular condition can include a disease, ailment or condition, such as for example, acute macular neuroretinopathy; Behcet's disease; choroidal neovascularization; diabetic uveitis; histoplasmosis; infections, such as fungal or viral-caused infections; macular degeneration, such as acute macular degeneration, non-exudative age related macular degeneration and exudative age related macular degeneration; edema, such as macular edema, cystoid macular edema and diabetic macular edema; multifocal choroiditis; ocular trauma which affects a posterior ocular site or location; ocular tumors; retinal disorders, such as central retinal vein occlusion, diabetic retinopathy (including proliferative diabetic retinopathy), proliferative vitreoretinopathy (PVR), retinal arterial occlusive disease, retinal detachment, uveitic retinal disease; sympathetic opthalmia; Vogt Koyanagi-Harada (VKH) syndrome; uveal diffusion; a posterior ocular condition caused by or influenced by an ocular laser treatment; posterior ocular conditions caused by or influenced by a photodynamic therapy, photocoagulation, radiation retinopathy, epiretinal membrane disorders, branch retinal vein occlusion, anterior ischemic optic neuropathy, non-retinopathy diabetic retinal dysfunction, retinitis pigmentosa, and glaucoma. Glaucoma can be considered a posterior ocular condition because the therapeutic goal is to prevent the loss of or reduce the occurrence of loss of vision due to damage to or loss of retinal cells or optic nerve cells (i.e. neuroprotection). The term “biodegradable polymer” refers to a polymer or polymers which degrade in vivo, and wherein erosion of the polymer or polymers over time occurs concurrent with or subsequent to release of the therapeutic agent. Specifically, hydrogels such as methylcellulose which act to release drug through polymer swelling are specifically excluded from the term “biodegradable polymer”. The terms “biodegradable” and “bioerodible” are equivalent and are used interchangeably herein. A biodegradable polymer may be a homopolymer, a copolymer, or a polymer comprising more than two different polymeric units. The term “treat”, “treating”, or “treatment” as used herein, refers to reduction or resolution or prevention of an ocular condition, ocular injury or damage, or to promote healing of injured or damaged ocular tissue. A treatment is usually effective to reduce at least one symptom of an ocular condition, ocular injury or damage. The term “therapeutically effective amount” as used herein, refers to the level or amount of agent needed to treat an ocular condition, or reduce or prevent ocular injury or damage without causing significant negative or adverse side effects to the eye or a region of the eye. In view of the above, a therapeutically effective amount of a therapeutic agent, such as a prostamide or prostamide derivative, is an amount that is effective in reducing at least one symptom of an ocular condition. Intraocular implants have been developed which can release drug loads over various time periods. These implants, which when inserted into an eye, such as the vitreous of an eye, provide therapeutic levels of a prostamide component for extended periods of time (e.g., for about 1 week or more). The disclosed implants are effective in treating ocular conditions, such as ocular conditions associated with elevated intraocular pressure, and more specifically in reducing at least one symptom of glaucoma. In one embodiment of the present invention, an intraocular implant comprises a biodegradable polymer matrix. The biodegradable polymer matrix is one type of a drug release sustaining component. The biodegradable polymer matrix is effective in forming a biodegradable intraocular implant. The biodegradable intraocular implant comprises a prostamide component associated with the biodegradable polymer matrix. The matrix degrades at a rate effective to sustain release of an amount of the prostamide component for a time greater than about one week from the time in which the implant is placed in ocular region or ocular site, such as the vitreous of an eye. wherein R5 is a lower alkyl radical having from one to six carbon atoms; Z is ═O or represents 2 hydrogen radicals; one of R1 and R2 is ═O, —OH or a —O(CO)R6 group, and the other one is —OH or —O(CO)R6, or R1 is ═O and R2 is H, wherein R6 is a saturated or unsaturated acyclic hydrocarbon group having from 1 to about 20 carbon atoms, or —(CH2)mR7 wherein m is 0 or an integer of from 1 to 10, and R7 is cycloalkyl radical, having from three to seven carbon atoms, or a hydrocarbyl aryl or heteroaryl radical, as defined above, or a pharmaceutically-acceptable salt thereof, provided, however, that when B is not substituted with a pendant heteroatom-containing radical, and Z is ═O, then X is not —OR4. Pharmaceutically acceptable acid addition salts of the compounds of the invention are those formed from acids which form non-toxic addition salts containing pharmaceutically acceptable anions, such as the hydrochloride, hydrobromide, hydroiodide, sulfate, or bisulfate, phosphate or acid phosphate, acetate, maleate, fumarate, oxalate, lactate, tartrate, citrate, gluconate, saccharate and p-toluene sulphonate salts. wherein y is 0 or 1, x is 0 or 1 and x+y are not both 1, Y is a radical selected from the group consisting of alkyl, halo, nitro, amino, thiol, hydroxy, alkyloxy, alkylcarboxy and halo substituted alkyl, wherein said alkyl radical comprises from one to six carbon atoms, n is 0 or an integer of from 1 to 3 and R3 is ═O, —OH or —O(CO)R6. wherein hatched lines indicate the α configuration and solid triangles indicate the β configuration. and the 9- and/or 11- and/or 15 esters thereof. The compound having the formula VI is also known as bimatoprost and is publicly available in a topical ophthalmic solution under the tradename, Lumigan® (Allergan, Inc., CA). Thus, the implant may comprise a therapeutic component which comprises, consists essentially of, or consists of bimatoprost, a salt thereof, or mixtures thereof. The prostamide component may be in a particulate or powder form and it may be entrapped by the biodegradable polymer matrix. Usually, prostamide particles will have an effective average size less than about 3000 nanometers. In certain implants, the particles may have an effective average particle size about an order of magnitude smaller than 3000 nanometers. For example, the particles may have an effective average particle size of less than about 500 nanometers. In additional implants, the particles may have an effective average particle size of less than about 400 nanometers, and in still further embodiments, a size less than about 200 nanometers. The prostamide component of the implant is preferably from about 10% to 90% by weight of the implant. More preferably, the prostamide component is from about 20% to about 80% by weight of the implant. In a preferred embodiment, the prostamide component comprises about 20% by weight of the implant (e.g., 15%-25%). In another embodiment, the prostamide component comprises about 50% by weight of the implant. Suitable polymeric materials or compositions for use in the implant include those materials which are compatible, that is biocompatible, with the eye so as to cause no substantial interference with the functioning or physiology of the eye. Such materials preferably are at least partially and more preferably substantially completely biodegradable or bioerodible. Other polymers of interest include, without limitation, polyvinyl alcohol, polyesters, polyethers and combinations thereof which are biocompatible and may be biodegradable and/or bioerodible. Some preferred characteristics of the polymers or polymeric materials for use in the present invention may include biocompatibility, compatibility with the therapeutic component, ease of use of the polymer in making the drug delivery systems of the present invention, a half-life in the physiological environment of at least about 6 hours, preferably greater than about one day, not significantly increasing the viscosity of the vitreous, and water insolubility. The biodegradable polymeric materials which are included to form the matrix are desirably subject to enzymatic or hydrolytic instability. Water soluble polymers may be cross-linked with hydrolytic or biodegradable unstable cross-links to provide useful water insoluble polymers. The degree of stability can be varied widely, depending upon the choice of monomer, whether a homopolymer or copolymer is employed, employing mixtures of polymers, and whether the polymer includes terminal acid groups. Equally important to controlling the biodegradation of the polymer and hence the extended release profile of the implant is the relative average molecular weight of the polymeric composition employed in the implant. Different molecular weights of the same or different polymeric compositions may be included in the implant to modulate the release profile. In certain implants, the relative average molecular weight of the polymer will range from about 9 to about 64 kD, usually from about 10 to about 54 kD, and more usually from about 12 to about 45 kD. The biodegradable polymer matrix of the intraocular implant may comprise a mixture of two or more biodegradable polymers. For example, the implant may comprise a mixture of a first biodegradable polymer and a different second biodegradable polymer. One or more of the biodegradable polymers may have terminal acid groups. Release of a drug from an erodible polymer is the consequence of several mechanisms or combinations of mechanisms. Some of these mechanisms include desorption from the implant's surface, dissolution, diffusion through porous channels of the hydrated polymer and erosion. Erosion can be bulk or surface or a combination of both. As discussed herein, the matrix of the intraocular implant may release drug at a rate effective to sustain release of an amount of the prostamide component for more than one week after implantation into an eye. In certain implants, therapeutic amounts of the prostamide component are released for no more than about 30-35 days after implantation. For example, an implant may comprise bimatoprost, and the matrix of the implant degrades at a rate effective to sustain release of a therapeutically effective amount of bimatoprost for about one month after being placed in an eye. As another example, the implant may comprise bimatoprost, and the matrix releases drug at a rate effective to sustain release of a therapeutically effective amount of bimatoprost for more than forty days, such as for about six months. One example of the biodegradable intraocular implant comprises an prostamide component associated with a biodegradable polymer matrix, which comprises a mixture of different biodegradable polymers. At least one of the biodegradable polymers is a polylactide having a molecular weight of about 63.3 kD. A second biodegradable polymer is a polylactide having a molecular weight of about 14 kD. Such a mixture is effective in sustaining release of a therapeutically effective amount of the prostamide component for a time period greater than about one month from the time the implant is placed in an eye. Another example of a biodegradable intraocular implant comprises an prostamide component associated with a biodegradable polymer matrix, which comprises a mixture of different biodegradable polymers, each biodegradable polymer having an inherent viscosity from about 0.16 dl/g to about 1.0 dl/g. For example, one of the biodegradable polymers may have an inherent viscosity of about 0.3 dl/g. A second biodegradable polymer may have an inherent viscosity of about 1.0 dl/g. Additional implants may comprise biodegradable polymers that have an inherent viscosity between about 0.2 dl/g and 0.5 dl/g. The inherent viscosities identified above may be determined in 0.1% chloroform at 25° C.
One particular implant comprises bimatoprost associated with a combination of two different polylactide polymers. The bimatoprost is present in about 20% by weight of the implant. One polylactide polymer has a molecular weight of about 14 kD and an inherent viscosity of about 0.3 dl/g, and the other polylactide polymer has a molecular weight of about 63.3 kD and an inherent viscosity of about 1.0 dl/g. The two polylactide polymers are present in the implant in a 1:1 ratio. Such an implant may be effective in releasing the bimatoprost for more than two months. The implant is provided in the form of a rod or a filament produced by an extrusion process. The release of the prostamide component from the intraocular implant comprising a biodegradable polymer matrix may include an initial burst of release followed by a gradual increase in the amount of the prostamide component released, or the release may include an initial delay in release of the prostamide component followed by an increase in release. When the implant is substantially completely degraded, the percent of the prostamide component that has been released is about one hundred. Compared to existing implants, the implants disclosed herein do not completely release, or release about 100% of the prostamide component, until after about one week of being placed in an eye. It may be desirable to provide a relatively constant rate of release of the prostamide component from the implant over the life of the implant. For example, it may be desirable for the prostamide component to be released in amounts from about 0.01 μg to about 2 μg per day for the life of the implant. However, the release rate may change to either increase or decrease depending on the formulation of the biodegradable polymer matrix. In addition, the release profile of the prostamide component may include one or more linear portions and/or one or more non-linear portions. Preferably, the release rate is greater than zero once the implant has begun to degrade or erode. The implants may be monolithic, i.e. having the active agent or agents homogenously distributed through the polymeric matrix, or encapsulated, where a reservoir of active agent is encapsulated by the polymeric matrix. Due to ease of manufacture, monolithic implants are usually preferred over encapsulated forms. However, the greater control afforded by the encapsulated, reservoir-type implant may be of benefit in some circumstances, where the therapeutic level of the drug falls within a narrow window. In addition, the therapeutic component, including the prostamide component, may be distributed in a non-homogenous pattern in the matrix. For example, the implant may include a portion that has a greater concentration of the prostamide component relative to a second portion of the implant. The intraocular implants disclosed herein may have a size of between about 5 μm and about 10 mm, or between about 10 μm and about 1 mm for administration with a needle, greater than 1 mm, or greater than 2 mm, such as 3 mm or up to 10 mm, for administration by surgical implantation. For needle-injected implants, the implants may have any appropriate length so long as the diameter of the implant permits the implant to move through a needle. For example, implants having a length of about 6 mm to about 7 mm have been injected into an eye. The implants administered by way of a needle should have a diameter that is less than the inner diameter of the needle. In certain implants, the diameter is less than about 500 μm. The vitreous chamber in humans is able to accommodate relatively large implants of varying geometries, having lengths of, for example, 1 to 10 mm. The implant may be a cylindrical pellet (e. g., rod) with dimensions of about 2 mm×0.75 mm diameter. Or the implant may be a cylindrical pellet with a length of about 7 mm to about 10 mm, and a diameter of about 0.75 mm to about 1.5 mm. The implants may also be at least somewhat flexible so as to facilitate both insertion of the implant in the eye, such as in the vitreous, and accommodation of the implant. The total weight of the implant is usually about 250-5000 μg, more preferably about 500-1000 μg. For example, an implant may be about 500 μg, or about 1000 μg. For non-human individuals, the dimensions and total weight of the implant(s) may be larger or smaller, depending on the type of individual. For example, humans have a vitreous volume of approximately 3.8 ml, compared with approximately 30 ml for horses, and approximately 60-100 ml for elephants. An implant sized for use in a human may be scaled up or down accordingly for other animals, for example, about 8 times larger for an implant for a horse, or about, for example, 26 times larger for an implant for an elephant. Thus, implants can be prepared where the center may be of one material and the surface may have one or more layers of the same or a different composition, where the layers may be cross-linked, or of a different molecular weight, different density or porosity, or the like. For example, where it is desirable to quickly release an initial bolus of drug, the center may be a polylactate coated with a polylactate-polyglycolate copolymer, so as to enhance the rate of initial degradation. Alternatively, the center may be polyvinyl alcohol coated with polylactate, so that upon degradation of the polylactate exterior the center would dissolve and be, rapidly washed out of the eye. The implants may be of any geometry including fibers, sheets, films, microspheres, spheres, circular discs, plaques and the like. The upper limit for the implant size will be determined by factors such as toleration for the implant, size limitations on insertion, ease of handling, etc. Where sheets or films are employed, the sheets or films will be in the range of at least about 0.5 mm×0.5 mm, usually about 3-10 mm×5-10 mm with a thickness of about 0.1-1.0 mm for ease of handling. Where fibers are employed, the fiber diameter will generally be in the range of about 0.05 to 3 mm and the fiber length will generally be in the range of about 0.5-10 mm. Spheres may be in the range of about 0.5 μm to 4 mm in diameter, with comparable volumes for other shaped particles. The size and form of the implant can also be used to control the rate of release, period of treatment, and drug concentration at the site of implantation. Larger implants will deliver a proportionately larger dose, but depending on the surface to mass ratio, may have a slower release rate. The particular size and geometry of the implant are chosen to suit the site of implantation. The proportions of the prostamide component, polymer, and any other modifiers may be empirically determined by formulating several implants with varying proportions. A USP approved method for dissolution or release test can be used to measure the rate of release (USP 23; NF 18 (1995) pp. 1790-1798). For example, using the infinite sink method, a weighed sample of the implant is added to a measured volume of a solution containing 0.9% NaCl in water, where the solution volume will be such that the drug concentration is after release is less than 5% of saturation. The mixture is maintained at 37° C. and stirred slowly to maintain the implants in suspension. The appearance of the dissolved drug as a function of time may be followed by various methods known in the art, such as spectrophotometrically, HPLC, mass spectroscopy, etc. until the absorbance becomes constant or until greater than 90% of the drug has been released. In addition to the prostamide or prostamide derivatives included in the intraocular implants disclosed herein, the intraocular implants may also include one or more additional ophthalmically acceptable therapeutic agents. For example, the implant may include one or more antihistamines, one or more antibiotics, one or more beta blockers, one or more steroids, one or more antineoplastic agents, one or more immunosuppressive agents, one or more antiviral agents, one or more antioxidant agents, and mixtures thereof. Pharmacologic or therapeutic agents which may find use in the present systems, include, without limitation, those disclosed in U.S. Pat. No. 4,474,451, columns 4-6 and U.S. Pat. No. 4,327,725, columns 7-8. Examples of antibiotics include without limitation, cefazolin, cephradine, cefaclor, cephapirin, ceftizoxime, cefoperazone, cefotetan, cefutoxime, cefotaxime, cefadroxil, ceftazidime, cephalexin, cephalothin, cefamandole, cefoxitin, cefonicid, ceforanide, ceftriaxone, cefadroxil, cephradine, cefuroxime, ampicillin, amoxicillin, cyclacillin, ampicillin, penicillin G, penicillin V potassium, piperacillin, oxacillin, bacampicillin, cloxacillin, ticarcillin, azlocillin, carbenicillin, methicillin, nafcillin, erythromycin, tetracycline, doxycycline, minocycline, aztreonam, chloramphenicol, ciprofloxacin hydrochloride, clindamycin, metronidazole, gentamicin, lincomycin, tobramycin, vancomycin, polymyxin B sulfate, colistimethate, colistin, azithromycin, augmentin, sulfamethoxazole, trimethoprim, and derivatives thereof. Examples of steroids include corticosteroids, such as cortisone, prednisolone, flurometholone, dexamethasone, medrysone, loteprednol, fluazacort, hydrocortisone, prednisone, betamethasone, prednisone, methylprednisolone, riamcinolone hexacatonide, paramethasone acetate, diflorasone, fluocinonide, fluocinolone, triamcinolone, derivatives thereof, and mixtures thereof. Examples of antiviral agents include interferon gamma, zidovudine, amantadine hydrochloride, ribavirin, acyclovir, valciclovir, dideoxycytidine, phosphonoformic acid, ganciclovir, and derivatives thereof. Other therapeutic agents include squalamine, carbonic anhydrase inhibitors, alpha-2 adrenergic receptor agonists, antiparasitics, antifungals, and derivatives thereof. The amount of active agent or agents employed in the implant, individually or in combination, will vary widely depending on the effective dosage required and the desired rate of release from the implant. Usually the agent will be at least about 1, more usually at least about 10 weight percent of the implant, and usually not more than about 80, more usually not more than about 40 weight percent of the implant. Some of the present implants may comprise a prostamide component that comprises a combination of two or more different prostamide derivatives. One implant may comprise a combination of bimatoprost and latanoprost. Another implant may comprise a combination of bimatoprost and travoprost. As discussed herein, the present implants may comprise additional therapeutic agents. For example, one implant may comprise a combination of bimatoprost and a beta-adrenergic receptor antagonist. More specifically, the implant may comprise a combination of bimatoprost and Timolol®. Or, an implant may comprise a combination of bimatoprost and a carbonic anyhdrase inhibitor. For example, the implant may comprise a combination of bimatoprost and dorzolamide (Trusopt®). In addition to the therapeutic component, the intraocular implants disclosed herein may include effective amounts of buffering agents, preservatives and the like. Suitable water soluble buffering agents include, without limitation, alkali and alkaline earth carbonates, phosphates, bicarbonates, citrates, borates, acetates, succinates and the like, such as sodium phosphate, citrate, borate, acetate, bicarbonate, carbonate and the like. These agents advantageously present in amounts sufficient to maintain a pH of the system of between about 2 to about 9 and more preferably about 4 to about 8. As such the buffering agent may be as much as about 5% by weight of the total implant. Suitable water soluble preservatives include sodium bisulfite, sodium bisulfate, sodium thiosulfate, ascorbate, benzalkonium chloride, chlorobutanol, thimerosal, phenylmercuric acetate, phenylmercuric borate, phenylmercuric nitrate, parabens, methylparaben, polyvinyl alcohol, benzyl alcohol, phenylethanol and the like and mixtures thereof. These agents may be present in amounts of from 0.001 to about 5% by weight and preferably 0.01 to about 2% by weight. In at least one of the present implants, a benzylalkonium chloride preservative is provided in the implant, such as when the prostamide component consists essentially of bimatoprost. In some situations mixtures of implants may be utilized employing the same or different pharmacological agents. In this way, a cocktail of release profiles, giving a biphasic or triphasic release with a single administration is achieved, where the pattern of release may be greatly varied. Additionally, release modulators such as those described in U.S. Pat. No. 5,869,079 may be included in the implants. The amount of release modulator employed will be dependent on the desired release profile, the activity of the modulator, and on the release profile of the prostamide component in the absence of modulator. Electrolytes such as sodium chloride and potassium chloride may also be included in the implant. Where the buffering agent or enhancer is hydrophilic, it may also act as a release accelerator. Hydrophilic additives act to increase the release rates through faster dissolution of the material surrounding the drug particles, which increases the surface area of the drug exposed, thereby increasing the rate of drug bioerosion. Similarly, a hydrophobic buffering agent or enhancer dissolve more slowly, slowing the exposure of drug particles, and thereby slowing the rate of drug bioerosion. In certain implants, an implant comprising bimatoprost and a biodegradable polymer matrix is able to release or deliver an amount of bimatoprost between about 0.1 mg to about 0.5 mg for about 3-6 months after implantation into the eye. The implant may be configured as a rod or a wafer. A rod-shaped implant may be derived from filaments extruded from a 720 μm nozzle and cut into 1 mg size. A wafer-shaped implant may be a circular disc having a diameter of about 2.5 mm, a thickness of about 0.127 mm, and a weight of about 1 mg. Various techniques may be employed to produce the implants described herein. Useful techniques include, but are not necessarily limited to, solvent evaporation methods, phase separation methods, interfacial methods, molding methods, injection molding methods, extrusion methods, co-extrusion methods, carver press method, die cutting methods, heat compression, combinations thereof and the like. Specific methods are discussed in U.S. Pat. No. 4,997,652. Extrusion methods may be used to avoid the need for solvents in manufacturing. When using extrusion methods, the polymer and drug are chosen so as to be stable at the temperatures required for manufacturing, usually at least about 85 degrees Celsius. Extrusion methods use temperatures of about 25 degrees C. to about 150 degrees C., more preferably about 65 degrees C. to about 130 degrees C. An implant may be produced by bringing the temperature to about 60 degrees C. to about 150 degrees C. for drug/polymer mixing, such as about 130 degrees C., for a time period of about 0 to 1 hour, 0 to 30 minutes, or 5-15 minutes. For example, a time period may be about 10 minutes, preferably about 0 to 5 min. The implants are then extruded at a temperature of about 60 degrees C. to about 130 degrees C., such as about 75 degrees C.
In addition, the implant may be coextruded so that a coating is formed over a core region during the manufacture of the implant. Compression methods may be used to make the implants, and typically yield implants with faster release rates than extrusion methods. Compression methods may use pressures of about 50-150 psi, more preferably about 70-80 psi, even more preferably about 76 psi, and use temperatures of about 0 degrees C. to about 115 degrees C., more preferably about 25 degrees C.
The implants of the present invention may be inserted into the eye, for example the vitreous chamber of the eye, by a variety of methods, including placement by forceps or by trocar following making a 2-3 mm incision in the sclera. One example of a device that may be used to insert the implants into an eye is disclosed in U.S. patent Publication No. 2004/0054374. The method of placement may influence the therapeutic component or drug release kinetics. For example, delivering the implant with a trocar may result in placement of the implant deeper within the vitreous than placement by forceps, which may result in the implant being closer to the edge of the vitreous. The location of the implant may influence the concentration gradients of therapeutic component or drug surrounding the element, and thus influence the release rates (e.g., an element placed closer to the edge of the vitreous may result in a slower release rate). The present implants are configured to release an amount of prostamide component effective to treat an ocular condition, such as by reducing at least one symptom of the ocular condition. More specifically, the implants may be used in a method to treat glaucoma, such as open angle glaucoma, ocular hypertension, chronic angle-closure glaucoma, with patent iridotomy, psuedoexfoliative glaucoma, and pigmentary glaucoma. By implanting the prostamide component-containing implants into the vitreous of an eye, it is believed that the prostamide component is effective to enhance acqueous humour flow thereby reducing intraocular pressure. MACULOPATHIES/RETINAL DEGENERATION: Non-Exudative Age Related Macular Degeneration (ARMD), Exudative Age Related Macular Degeneration (ARMD), Choroidal Neovascularization, Diabetic Retinopathy, Acute Macular Neuroretinopathy, Central Serous Chorioretinopathy, Cystoid Macular Edema, Diabetic Macular Edema. VASCULAR DISEASES/EXUDATIVE DISEASES: Coat's Disease, Parafoveal Telangiectasis, Papillophlebitis, Frosted Branch Angitis, Sickle Cell Retinopathy and other Hemoglobinopathies, Angioid Streaks, Familial Exudative Vitreoretinopathy. GENETIC DISORDERS: Systemic Disorders with Accosiated Retinal Dystrophies, Congenital Stationary Night Blindness, Cone Dystrophies, Fundus Flavimaculatus, Best's Disease, Pattern Dystrophy of the Retinal Pigmented Epithelium, X-Linked Retinoschisis, Sorsby's Fundus Dystrophy, Benign Concentric Maculopathy, Bietti's Crystalline Dystrophy, pseudoxanthoma elasticum. In one embodiment, an implant, such as the implants disclosed herein, is administered to a posterior segment of an eye of a human or animal patient, and preferably, a living human or animal. In at least one embodiment, an implant is administered without accessing the subretinal space of the eye. For example, a method of treating a patient may include placing the implant directly into the posterior chamber of the eye. In other embodiments, a method of treating a patient may comprise administering an implant to the patient by at least one of intravitreal injection, subconjuctival injection, sub-tenon injections, retrobulbar injection, and suprachoroidal injection. In at least one embodiment, a method of reducing intraocular pressure in an eye of a patient comprises administering one or more implants containing a prostamide component, as disclosed herein to a patient by at least one of intravitreal injection, subconjuctival injection, sub-tenon injection, retrobulbar injection, and suprachoroidal injection. A syringe apparatus including an appropriately sized needle, for example, a 22 gauge needle, a 27 gauge needle or a 30 gauge needle, can be effectively used to inject the composition with the posterior segment of an eye of a human or animal. Repeat injections are often not necessary due to the extended release of the prostamide component from the implants. In addition, for dual therapy approaches to treating an ocular condition, the method may include one or more additional steps of administering additional therapeutic agents to the eye, such as by topically administering compositions containing timolol, dorzolamide, and iatoprost, among others. In another aspect of the invention, kits for treating an ocular condition of the eye are provided, comprising: a) a container comprising an extended release implant comprising a therapeutic component including a prostamide component, such as bimatoprost (Lumigan), and a drug release sustaining component; and b) instructions for use. Instructions may include steps of how to handle the implants, how to insert the implants into an ocular region, and what to expect from using the implants. In certain implants, the implant comprises a therapeutic component which consists essentially of bimatoprost, salts thereof, and mixtures thereof, and a biodegradable polymer matrix. The biodegradable polymer matrix may consist essentially of PLA, PLGA, or a combination thereof. When placed in the eye, the implant releases about 40% to about 60% of the bimatoprost to provide a loading dose of the bimatoprost within about one day after placement in the eye. Subsequently, the implant releases about 1% to about 2% of the bimatoprost per day to provide a sustained therapeutic effect. Such implants may be effective in reducing and maintaining a reduced intraocular pressure, such as below about 15 mm Hg for several months, and potentially for one or two years. Other implants disclosed herein may be configured such that the amount of the prostamide component that is released from the implant within two days of being placed in the eye is less than about 95% of the total amount of the prostamide component in the implant. In certain implants, 95% of the prostamide component is not released until after about one week of being placed in an eye. In certain implants, about 50% of the prostamide component is released within about one day of placement in the eye, and about 2% is released for about 1 month after being placed in the eye. In other implants, about 50% of the prostamide component is released within about one day of placement in the eye, and about 1% is released for about 2 months after being placed in the eye. Biodegradable implants were made by combining bimatoprost with a biodegradable polymer composition. 800 mg of polylactic acid (PLA) was combined with 200 mg of bimatoprost. The combination was dissolved in 25 milliliters of dichloromethane. The mixture was placed in a vacuum at 45° C. overnight to evaporate the dichloromethane. The resulting mixture was in the form of a cast sheet. The cast sheet was cut and ground in a high shear grinder with dry ice until the particles could pass through a sieve having a pore size of about 125 μm. The percent of bimatoprost present in the microparticles was analyzed using high pressure liquid chromatography (HPLC). The percent release of bimatoprost from the microparticles was profiled using dialysis. The percent of bimatoprost remaining in the recovered particles was analyzed by HPLC. The release profile is described in Table 1. The percent loading of bimatoprost was 14.93%. The percent of bimatoprost remaining in the recovered release particles was 4.94%. Bimatoprost is combined with a biodegradable polymer composition in a mortar. The combination is mixed with a shaker set at about 96 RPM for about 15 minutes. The powder blend is scraped off the wall of the mortar and is then remixed for an additional 15 minutes. The mixed powder blend is heated to a semi-molten state at specified temperature for a total of 30 minutes, forming a polymer/drug melt. Rods are manufactured by pelletizing the polymer/drug melt using a 9 gauge polytetrafluoroethylene (PTFE) tubing, loading the pellet into the barrel and extruding the material at the specified core extrusion temperature into filaments. The filaments are then cut into about 1 mg size implants or drug delivery systems. The rods may have dimensions of about 2 mm long×0.72 mm diameter. The rod implants weigh between about 900 μg and 1100 μg. Wafers are formed by flattening the polymer melt with a Carver press at a specified temperature and cutting the flattened material into wafers, each weighing about 1 mg. The wafers have a diameter of about 2.5 mm and a thickness of about 0.13 mm. The wafer implants weigh between about 900 μg and 1 100 μg. In-vitro release testing is performed by placing each implant into a 24 mL screw cap vial with 10 mL of Phosphate Buffered Saline solution at 37° C. 1 mL aliquots are removed and are replaced with equal volume of fresh medium on day 1, 4, 7,14, 28, and every two weeks thereafter. Drug assays are performed by HPLC, which consists of a Waters 2690 Separation Module (or 2696), and a Waters 2996 Photodiode Array Detector. An Ultrasphere, C-18 (2), 5 μm; 4.6×150 mm column heated at 30° C. is used for separation and the detector is set at about 264 nm. The mobile phase is (10:90) MeOH-buffered mobile phase with a flow rate of 1 mumin and a total run time of 12 min per sample. The buffered mobile phase may comprise (68:0.75:0.25:31) 13 mM 1-Heptane Sulfonic Acid, sodium salt-glacial acetic acid-triethylamine-Methanol. The release rates are determined by calculating the amount of drug being released in a given volume of medium over time in μg/day. Polymers which may be used in the implants can be obtained from Boehringer lngelheim. Examples of polymer insclude: RG502, RG752, R202H, R203 and R206, and Purac PDLG (50/50). RG502 is (50:50) poly(D,L-lactide-co-glycolide), RG752 is (75:25) poly(D,L-lactide-co-glycolide), R202H is 100% poly(D,L-lactide) with acid end group or terminal acid groups, R203 and R206 are both 100% poly(D,L-lactide). Purac PDLG (50/50) is (50:50) poly(D,L-lactide-co-glycolide). The inherent viscosity of RG502, RG752, R202H, R203, R206, and Purac PDLG are 0.2, 0.2, 0.2, 0.3, 1.0, and 0.2 dL/g, respectively. The average molecular weight of RG502, RG752, R202H, R203, R206, and Purac PDLG are, 1 1700, 11200, 6500, 14000, 63300, and 9700 daltons, respectively. A 72 year old female suffering from glaucoma in both eyes receives an intraocular implant containing bimatoprost and a combination of a PLA and PLGA in each eye. The implants weigh about 1 mg, and contain about 500 mg of bimatoprost. One implant is placed in the vitreous of each eye using a syringe. In about two days, the patient reports a substantial relief in ocular comfort. Examination reveals that the intraocular pressure has decreased, the average intraocular pressure measured at 8:00 AM has decreased from 28 mm Hg to 14.3 mm Hg. The patient is monitored monthly for about 6 months. Intraocular pressure levels remain below 15 mm Hg for six months, and the patient reports reduced ocular discomfort. A 62 year old male presents with an intraocular pressure in his left eye of 33 mm Hg. An implant containing 400 mg of bimatoprost and 600 mg of PLA is inserted into the vitreous of the left eye using a trocar. The patient's intraocular pressure is monitored daily for one week, and then monthly thereafter. One day after implantation, the intraocular pressure is reduced to 18 mm Hg. By day 7 after implantation, the intraocular pressure is relatively stable at 14 mm Hg. The patient does not experience any further signs of elevated intraocular pressure for 2 years. All references, articles, publications and patents and patent applications cited herein are incorporated by reference in their entireties. a prostamide component and a biodegradable polymer matrix that releases drug at a rate effective to sustain release of a therapeutically effective amount of the prostamide component for at least about one week after the implant is placed in an eye. 2. The implant of claim 1, wherein the prostamide component comprises a single type of a prostamide derivative. 3. The implant of claim 1, wherein the prostamide component comprises at least one prostamide derivative selected from the group consisting of bimatoprost, salts thereof, and mixtures thereof. 4. The implant of claim 1, wherein the prostamide component consists essentially of bimatoprost. 5. The implant of claim 1, wherein the prostamide component comprises a combination of two or more different prostamide derivatives. 6. The implant of claim 5, wherein the prostamide component comprises a combination of bimatoprost and iatanoprost. 7. The implant of claim 5, wherein the prostamide component comprises a combination of bimatoprost and travoprost. 8. The implant of claim 1, wherein the prostamide component comprises bimatoprost, and the implant further comprises a beta-adrenergic receptor antagonist. 9. The implant of claim 8, wherein the beta-adrenergic receptor antagonist is timolol. 10. The implant of claim 1, wherein the prostamide component comprises bimatoprost and the implant further comprises a carbonic anhydrase inhibitor. 11. The implant of claim 10, wherein the carbonic anhydrase inhibitor is dorzolamide. 12. The implant of claim 1, wherein the prostamide component is dispersed within the biodegradable polymer matrix. 13. The implant of claim 1, wherein the prostamide component comprises bimatoprost provided in an amount of about 0.1% to about 90% by weight of the implant. wherein y is 0 or 1, x is 0 or 1 and x+y are not both 1, Y is a radical selected from the group consisting of alkyl, halo, nitro, amino, thiol, hydroxy, alkyloxy, alkylcarboxy and halo substituted alkyl, wherein said alkyl radical comprises from one to six carbon atoms, n is 0 or an integer of from 1 to 3 and R3 is ═O, —OH or —O(CO) R6. wherein hatched lines indicate the c configuration and solid triangles indicate the β configuration. wherein Y1 is Cl or trifluoromethyl. and the 9-and/or 11- and/or 15 esters thereof. 19. The implant of claim 1, wherein the matrix comprises a mixture of two different biodegradable polymers, each polymer selected from the group consisting of polylactic acid, polyglycolic acid, polylactide-co-glycolide, derivatives thereof, and mixtures thereof. 20. The implant of claim 19, wherein the matrix comprises a mixture of two different polylactic acids. 21. The implant of claim 19, wherein the matrix comprises a mixture of a polylactic acid and a polylactide-co-glycolide. 22. The implant of claim 1, wherein the matrix comprises a mixture of different biodegradable polymers, each biodegradable polymer having a different inherent viscosity. 23. The implant of claim 1, wherein the matrix comprises a mixture of different biodegradable polymers, each polymer having a different molecular weight. 24. The implant of claim 1, wherein the matrix releases drug at a rate effective to sustain release of an amount of the prostamide component from the implant for more than one month from the time the implant is placed in the vitreous of the eye. 25. The implant of claim 1, wherein the prostamide component comprises bimatoprost, and the matrix releases drug at a rate effective to sustain release of a therapeutically effective amount of bimatoprost for about three months. 26. The implant of claim 1, wherein the therapeutically effective amount of the prostamide component is an amount effective to stimulate aqueous humor outflow in the eye in which the implant is placed. 27. The implant of claim 1, further comprising a prostaglandin analog. 28. The implant of claim 27, wherein the prostaglandin analog is unoprostone. 29. The implant of claim 1, further comprising an intraocular pressure lowering drug other than a prostamide derivative. 30. The implant of claim 1, wherein the implant is structured to be placed in the vitreous of the eye. 31. The implant of claim 1 which is formed by an extrusion process. 32. A method of making a biodegradable intraocular implant, comprising the step of: extruding a mixture of a prostamide component and a biodegradable polymer component to form a biodegradable material that releases drug at a rate effective to sustain release of an amount of the prostamide component from the implant in an eye in which the implant is placed. 33. The method of claim 32, wherein the prostamide component comprises at least one prostamide derivative selected from the group consisting of bimatoprost, salts thereof, and mixtures thereof. 34. The method of claim 32, wherein the prostamide component consists essentially of bimatoprost. 35. The method of claim 32, further comprising a step of mixing the prostamide component with the polymer component before the extrusion step. 36. The method of claim 32, wherein the prostamide component and the polymer component are in a powder form. 37. The method of claim 32, wherein the polymer component comprises a mixture of two different biodegradable polymers, each polymer selected from the group consisting of polylactic acid, polyglycolic acid, polylactide-co-glycolide, derivatives thereof, and mixtures thereof. 38. The method of claim 32, wherein the polymer component comprises a mixture of two different biodegradable polymers, each biodegradable polymer having a different inherent viscosity. 39. A method of treating an ocular condition in an eye of a patient, comprising the step of placing a biodegradable intraocular implant in an eye of the patient, the implant comprising a prostamide component and a biodegradable polymer matrix that releases drug at a rate effective to sustain release of an amount of the prostamide component from the implant to provide an amount of the prostamide component effective to prevent or reduce a symptom of the ocular condition of the eye. 40. The method of claim 39, wherein the method is effective to treat glaucoma. 41. The method of claim 39, wherein the placement of the implant in the eye is effective in reducing intraocular pressure in the eye. 42. The method of claim 39, wherein the implant is placed in the posterior of the eye. 43. The method of claim 39, wherein the implant is placed in the eye using a trocar. 44. The method of claim 39, wherein the implant is placed in the eye using a syringe. 45. The method of claim 39, further comprising a step of administering a therapeutic agent in addition to the prostamide component to the patient. 46. The method of claim 39, wherein the prostamide component comprises at least one prostamide selected from the group consisting of bimatoprost, a derivative thereof, salts thereof, and mixtures thereof. 47. The method of claim 39, wherein the placement of the implant in the eye is effective in increasing aqueous humor outflow. 48. The method of claim 47, wherein the release of the prostamide component is effective for at least two weeks after placement in the eye. ES05740976T ES2304701T3 (en) 2004-04-30 2005-04-20 Intraocular implants contain biodegradable prostamides. AT101342T (en) 1988-09-06 1994-02-15 Kabi Pharmacia Ab Prostaglandin derivatives for the treatment of glaucoma and ocular hypertension.